Zebra finches (poephila guttata) can be found all around Australia, except for the northwestern, southeastern, and southwestern coasts. They average 4 inches (10 cm) in length and weigh between 10 to 16 grams. Lots of color variations have been bred in captivity. Please refer to photos on this page. 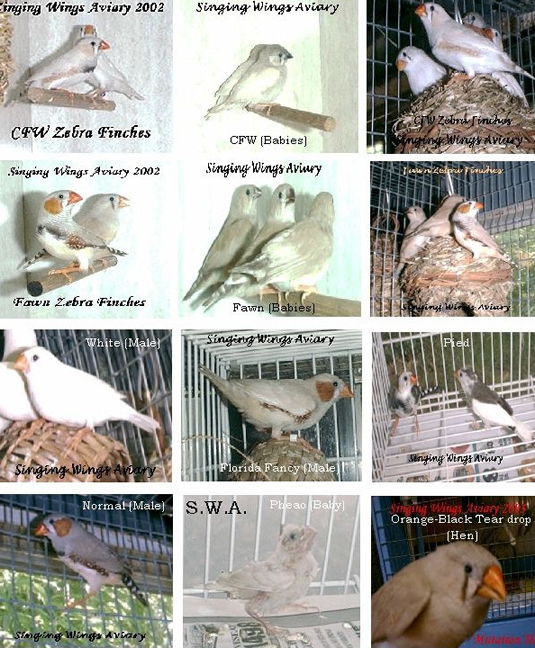 I kept and bred zebra finches for years and it was one of my most enjoyable experiences. They did well in my large, planted aviary; got along great with other finches and canaries. They come in many beautiful mutations (please refer to the photos below); although the natural coloring is already very pretty -- it does provide for some nice visual variety in the aviary. 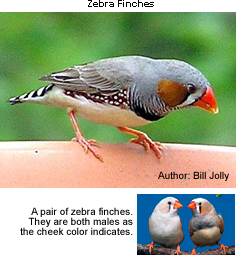 Event though Zebra finches are generally considered "decorative," it is possible to hand-tame a zebra finch. However, you would have to tame him at a very early age and not provide him with a mate. Finches are very social creatures. They need plenty of social interaction. They were excellent parents and continuously produced off-spring. 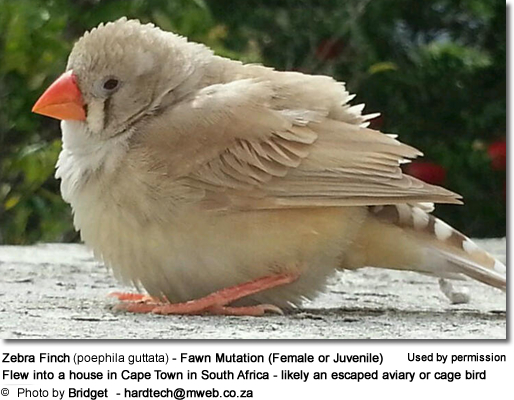 A few pairs turned into a hundred finches within a year. If you don't want that many finches, you can either sell the offspring, or you can replace the eggs with dummy eggs. Alternatively, there are ways of rendering laid eggs unviable. During the laying period (before incubation has started), the eggs are still dormant and vigorously shaking the eggs causes the internal structure to change (comparable to scrambling the egg inside the shell). Each shaken egg should be dated with a crayon the day it is shaken and returned to the nest. Do not remove eggs permanently as this will only motivate the hen to lay new eggs, which will deplete her from necessary minerals, potentially causing serious health problems or even death. Please do not shake after the incubation has begun, as it may result in deformed chicks.